I am still holding out hope for spring. The ground has transitioned from snow to mud, and I am diving into my stash for bright colored yarns. There may not be any fragrant blossoms in my yard yet, but I am going to add crochet blooms to my wardrobe. But what flowers to use? 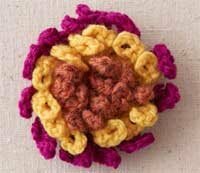 This time I want to crochet a flower that's a little more complicated than the simple five petal flowers I usually whip up. Then I found Robyn Chachula's newest video, Crochet Flowers. She walks you through reading stitch diagrams as well as creating crochet irises, roses, and more. Here is Robyn to tell us more. Looking to add a touch of spring to your crochet projects? Then come join me as we learn five fun flowers patterns that you can add to any sweater, hat, jewelry or more projects. We will be learning how to make three-dimensional flowers that all work from the center ring out to make extremely different flowers by playing with where you place your hook. We will learn how to make a simple blossom with popcorn stitches, an easy iris with picots, a quick crocus by playing in our backloop, a classic Victorian rose with as many layers and petals as you wish, and my favorite cornflower by using tons of short rows. I have written a number of books on crochet from teaching crochet symbols in my Blueprint Crochet Series to exploring the many varied crochet techniques in Crochet Stitches Visual Encyclopedia and Unexpected Afghans. You can definitely say I am a bit obsessed with crochet. My goal is, by the end of the class, making sure you have enough flower patterns to crochet yourself an entire garden. 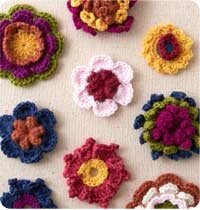 I hope you are now excited to go and crochet yourself a garden with the blossom, iris, crocus, Victorian rose, and cornflower motifs. Hats, bags, scarves, and jewelry-the list of pieces I want to embellish with crochet flowers is growing. And I definitely have to try the Blossom Flower. Pre-order or download your copy of Robyn Chachula Crochet Flowers video and discover how to create a garden of blossoms with hook and yarn. P.S. 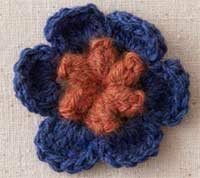 How do you embellish with crochet flowers? Share your tips in the comments.